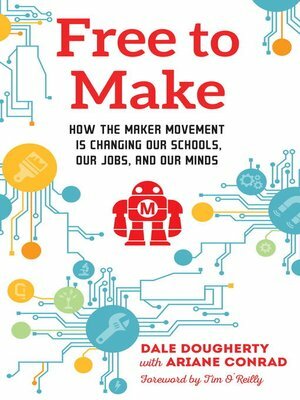 Dale Dougherty, creator of MAKE: magazine and the Maker Faire, provides a guided tour of the international phenomenon known as the Maker Movement, a social revolution that is changing what gets made, how it's made, where it's made, and who makes it. Free to Make is a call to join what Dougherty calls the "renaissance of making," an invitation to see ourselves as creators and shapers of the world around us. As the internet thrives and world-changing technologies—like 3D printers and tiny microcontrollers—become increasingly affordable, people around the world are moving away from the passivity of one-size-fits-all consumption and command-and-control models of education and business. Free to Make explores how making revives abandoned and neglected urban areas, reinvigorates community spaces like libraries and museums, and even impacts our personal and social development—fostering a mindset that is engaged, playful, and resourceful. Free to Make asks us to imagine a world where making is an everyday occurrence in our schools, workplaces, and local communities, grounding us in the physical world and empowering us to solve the challenges we face.